The spectral composition of underwater light in a given water body varies markedly with depth and at any specified depth it varies with the optical properties of the water (Chapter 6). Thus, in order to assess the suitability of a given underwater light field for photosynthesis by different kinds of aquatic plant, we need to know in what ways the photosynthetic rates of the various plant types depend upon the wavelengths of the light to which they are exposed. 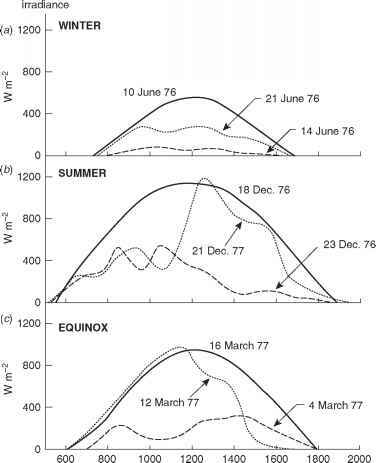 Some of the information we need can be provided by an action spectrum of photosynthesis: this is the curve obtained by plotting the photosynthetic response of a plant per unit incident irradiance (quanta m-2s-1) of incident light at a series of wavelengths across the photosynthetic range. Action spectra are normally measured at light intensities low enough to ensure that the response is proportional to the incident irradiance, i.e. they are measured in the initial, linear region of the P versus Ed curve. The rate of photosynthesis at any wavelength under these conditions will be equal to the rate of photon absorption times the quantum yield, f. In the case of a macrophyte thallus or leaf, the rate of light absorption at a given wavelength is proportional to the absorptance at that wavelength. Thus the action spectrum will have a shape similar to that of the absorptance spectrum, modified by any variation in quantum yield with wavelength that may occur (see later). The action spectrum of macrophytes can usually be measured on a single leaf or thallus or piece thereof, and can reasonably be taken as representative of the ability of the original plant in situ to make use of light of different wavelengths. In the case of phytoplankton, however, action spectra must for practical reasons be measured on suspensions containing many cells or colonies: sometimes, if reasonable rates are to be achieved, on concentrated suspensions. How does an action spectrum determined on a suspension relate to the action spectrum we wish to know, namely that of the individual cell or colony? The action spectrum of a cell or colony would be identical to the spectral variation in rate of absorption of quanta, modified as usual by any variation in quantum yield. The average rate of absorption of quanta per individual cell or colony, from a light beam, is the product of the irradiance and the mean absorption cross-section (spAp) of the cells or colonies (§ 9.4). Thus the action spectrum of a single cell or colony would have the same shape (allowing for variations in f) as the spectral variation in spAp and this is fixed, being determined only by the absorption characteristics of the individual cells or colonies. The action spectrum of the phytoplankton suspension measured in the laboratory will, by contrast, have the same shape (allowing for variations in f), as the absorptance spectrum of the whole suspension. The shape of this spectrum is not fixed, being a function of the number of cells/colonies per unit area of the illuminating beam. Since absorptance can only approach 1.0 and can never exceed it, the absorptance at weakly absorbed wavelengths (e.g. in the green in the case of chlorophytes, diatoms etc.) progressively approaches absorptance at strongly absorbed wavelengths (e.g. at the chlorophyll red peak) as the concentration of cells or colonies increases. From its definition (§3.2) it follows that the dbsorbdnce of the suspension, Dsus is equal to - 0.434 ln (1 - Asus), where Asus is the absorptance of the suspension. From this it in turn follows (since ln(1 + x) « x, when x « 1) that for low values of Asus, Dsus« 0.434 Asus. We saw earlier (§9.2) that Dsus = 0.434nspAp, and therefore at low values of Asus, Asus ~ nspAp where n is the number of cells or colonies per ml. The true action spectrum of the individual cells or colonies follows (allowing for variations in f) the spectral variation in spAp (see above). Therefore, the action spectrum of the suspension will have approximately the same shape as the action spectrum of the individual cells or colonies provided that it is measured on suspensions with low values of absorptance. The discrepancies are about 5, 11 and 19% when Asus is 0.1, 0.2 and 0.3, respectively. The general effect of the error is that the action spectrum of the suspension will be flattened (i.e. peaks lowered relative to the valleys) compared to the true action spectrum of the cells or colonies. It will be observed that the action spectrum falls below the absorption spectrum in certain spectral regions. This means that the amount of photosynthesis achieved per unit light absorbed is lower, i.e. the quantum yield is lower, at these wavelengths than at others. Figure 10.7 shows the quantum yield as a function of wavelength in the blue-green alga Chroococcus, the green alga Chlorella and the diatom Navicula.359,360,1343 A fall in quantum yield is observed on the long-wavelength side (680-710 nm) of the chlorophyll a red absorption peak, and also in the region of carotenoid absorption (440-520 nm), this latter fall being particularly marked in the blue-green alga and significant in the green alga but only slight in the diatom. Such observations led to the belief, initially, that while light absorbed by the carotenoid fucoxanthin in diatoms is efficiently used for photosynthesis, light absorbed by carotenoids in blue-green and green algae is used with much lower efficiency. While there can indeed be some variation in the efficiency with which light absorbed by different pigments is utilized for photosynthesis, it is now thought that this is not the major factor involved in the fall in quantum yield. Furthermore, the explanation originally suggested for the decrease in f in the far-red - namely, that the quanta are insufficiently energetic to bring about photosynthesis - is also incorrect. Fig. 10.6 Action spectra of photosynthesis in multicellular and unicellular algae. In (a)-(d) the action spectrum (photosynthetic rate per unit incident irradiance) has been plotted so that it coincides with the absorptance spectrum at some appropriate wavelength. (a), (b) and (c) - bare platinum electrode method (after Haxo and Blinks, 1950). (d) - manometric method (after Emerson and Lewis, 1943); the spectra in this case were obtained with dense suspensions and so do not accurately correspond to the absorption and action spectra of individual cells (see text). (e) - 14CO2 method (plotted from data of Iverson and Curl, 1973). (a) Ulva taeniata (multicellular green). (b) Coilodesme californica (multicellular brown). (c) Delesseria decipiens (multicellular red, from shaded habitat). (d) Chlorella pyrenoidosa (unicellular freshwater chlorophyte). (e) Skeletonema costatum (marine diatom). The variation in quantum yield with wavelength is now considered to be primarily due to the fact that there are two light reactions, both of which must be energized for photosynthesis to occur, and which have - to an extent varying with the algal type - different light-harvesting pigment arrays with differing absorption spectra. Thus, during the measurement of an action spectrum, when the wavelength of the monochromatic light provided is strongly absorbed by one photosystem but weakly by the other, then the two light reactions do not operate at the same rate and so photo-synthetic efficiency is low. For example, 680 to 710 nm light is absorbed quite well by photosystem I but poorly by photosystem II. Consequently when cells are illuminated with far-red light, the rate of photosynthesis is low because photosystem II cannot keep up with photosystem I.
Emerson (1958) showed that if Chlorella cells illuminated with far-red light were simultaneously exposed to light absorbed by chlorophyll b (which transfers most, perhaps all, its energy to photosystem II), then the quantum yield increased above that expected on the basis of the additive contributions of the two kinds of light alone. This phenomenon, of a synergistic effect of two wavebands of light, is referred to as enhancement and can plausibly be explained in terms of the existence of the two photosystems. Invoking the photosystems to explain the dependence of quantum yield on wavelength immediately raises problems of its own however. The virtually constant and high value of f between 560 and 680 nm (Fig. 10.7) indicates that both photosystems are working at the same rate throughout this wavelength range, which is rather surprising in view of the differing pigment complements of the two photosystems. The generally accepted explanation of this phenomenon, originally proposed by Myers and Graham (1963), is that when photosystem II is absorbing light faster than photosystem I, some of its excitation energy is transferred to photosystem I, so that both systems can operate at the same rate. This is known as the 'spillover' hypothesis, and there is now good evidence for its validity:191 transfer of energy from photosystem I to II does not appear to take place. Put simply, light absorbed by photosystem II can be used to drive both light reactions; light absorbed by photosystem I drives only light reaction I. We may therefore take the fall-off in quantum yield in certain parts of the spectrum as indicating that in those spectral regions absorption is mainly due to photosystem I pigments. Fig. 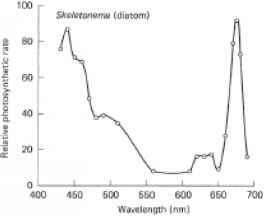 10.8 Photosynthetic action spectra of the red alga Cryptopleura crispa measured with and without background green (546 nm) light, together with the absorptance spectrum (from Fork, 1963). Reproduced from Photosynthetic Mechanisms in Green Plants. Washington, DC: National Academy Press (1963). photosystem I. In algae such as the diatoms, brown algae and green algae, where the pigment arrays of the two photosystems are not so different, the difference between action spectra measured with and without background photosystem II light is not so marked. It can be observed in Fig. 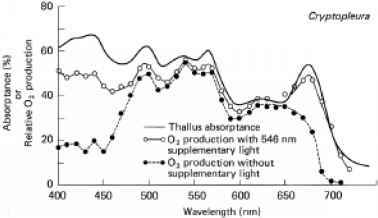 10.8 that the action spectrum measured with background photosystem II light is fairly close to the absorptance spectrum of the thallus. A similar observation has been made for other red algae.1128 In the absence of action spectra data measured with background photosystem II light, the absorptance spectrum may be used as an approximate guide to the ability of an aquatic plant not only to capture but also to use light of different wavelengths. The discrepancies between the absorptance spectra and the photosystem II-supplemented action spectra of aquatic plants are nevertheless significant and of interest. It has been observed for a number of red algae,405,1128 and can be seen in Fig. 10.8, that the green-supplemented action spectrum falls significantly below the absorptance spectrum in the 400 to 520 nm region, indicating that some of the pigment molecules absorbing in this region are not transferring their excitation energy efficiently to the reaction centres. The molecules in question are probably carotenoids. It seems unlikely that the carotenoids in the red algae are completely inactive: if they were inactive we would expect a much greater fall in the green-supplemented action spectrum between 450 and 500 nm. The photosystem II-supplemented action spectrum of the blue-green alga Anacystis also indicates that carotenoids contribute excitation energy for photosynthesis.654 The photosynthetically inactive carotenoid is in some cases likely to consist mainly of zeaxanthin, which, as we have noted earlier, appears to have the function of protecting the photosynthetic system against excessive light levels. Thus, in the red and blue-green, and possibly also green and xantho-phycean algae466 the absorption spectrum is likely, because of the inactivity of some of the xanthophyll molecules, partly to overestimate the ability of the cells to utilize light in the blue region of the spectrum. In those algal groups (diatoms, phaeophytes, dinoflagellates, siphonous green algae) that rely heavily on specialized carotenoids (fucoxanthin, peridinin, siphonaxanthin) for light harvesting, however, the major carot-enoid species transfer their absorbed energy to the reaction centres as efficiently as does chlorophyll. 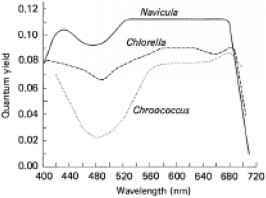 In these algae we may reasonably assume that the absorption spectrum (absorptance or absorption cross-section, as appropriate) is quite an accurate guide to the ability of the cells to utilize light in all regions of the photosynthetic spectrum, although even in these cases there are minor carotenoids - such as diadinoxanthin in the coccolithophorid, Emiliania huxleyi,546 which are photosynthetically ineffective.